Huntingdon Fusion Techniques USA Partner has recently helped solve a major environmental problem in a remote area of Oregon. 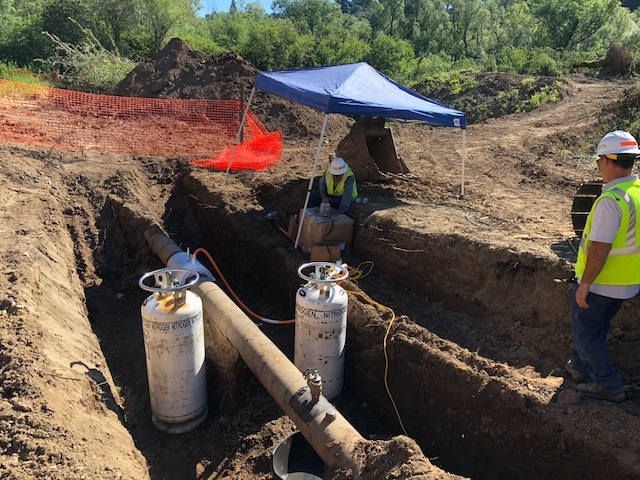 Construction of a new access to the Willamette River was necessary, as part of a plan to replenish a salmon hatchery but this necessitated removal of part of a 10 inch (254 mm) pipeline that was causing an obstruction. The pipeline had been isolated and abandoned previously and filled with water that had probably become polluted. Simply cutting the pipeline would release over 1 million 300 thousand gallons (5,000 m3) of contaminated water into surrounding land lying within a sensitive, environmentally protected area. A decision was made to use liquid nitrogen to create ice plugs and isolate the small section of pipe causing the obstruction. The pipe could then be cut, releasing only limited contaminated water and this could be contained and removed from the site. Pits were excavated on either side of the access exposing the pipe and the anti-corrosion coating was removed. Freezing commenced in the early morning in record high temperatures combined with little to no shade in the area. The pipe was cut on both sides and the remaining contaminated water drained to disposal containers for removal. Welders quickly capped the open ends. The freeze equipment was shut down and the ice plugs allowed to thaw naturally. The proposed river access refurbishment was allowed to continue the following week bringing life back to a vital natural habitat. The equipment employed for the freezing operation was an Accu-Freeze system. The procedure creates an in-line ice plug capable of withstanding 140 bar in pipes up to 12 inch (305 mm) diameter and can be modified using available options to handle even larger diameters. A specially designed insulated aluminium jacket is placed around the required section of pipe to be frozen. An advanced temperature-monitoring unit controls the surface wall temperature of the pipe to accurately and safely create a short ice plug that does not extend outside the jacket. Accu-Freeze is automatic and can be remotely operated making it attractive for use in nuclear applications and other locations where engineer access has to be restricted. Freezing using liquid nitrogen is effective down to -184ºF (-120ºC) so is suitable for isolating sections of pipe carrying petrochemicals so that valves and other control devices can be removed without the expense and delays involved in draining the system. The concept of isolation using liquid nitrogen had been used in the past to resolve major problems with a NASA launch vehicle and inside large chemical plant.